The LP980 spectrometer sets the standard for technical performance required in a premier research instrument, offering unsurpassed measurement capabilties across a broad range of chemical, physical and biological applications. At the heart of the LP980 is a fully integrated and sophisticated transient absorption spectrometer. It uses the pump-probe technique for measuring transient kinetics and sepctra. In kinetic mode (K) a single point detector is used to measure the transient kinetics at a single wavelength (spectra can be built up by automated scanning over a wavelength range and slicing the data). In spectral mode (S) a gated intensified CCD is used to capture the whole spectrum in the presence and absence of the pump laser pulse, meaning the whole spectrum can be generated after one laser pulse. 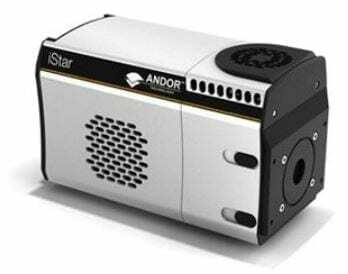 The LP980 spectrometer has a dual sample chamber that enables users to reliably and accurately measure transient chemical and biological species up to 2.55 µm using the pump-probe technique AND laser-induced fluorescence lifetimes down to nanosecond time ranges. Transverse sample excitation geometry comes as standard. Thin-film, diffuse reflection, fluorescence and phosphorescence lifetime measurement accessories are available as options. Our tried and tested advanced software, the L900 package, is capable of dual mode measurement removing the need to make any manual mechanical adjustments. The software has an easy-to-use graphical user interface that simplifies a users ability to take measurements easily. Users can comprehensively manipulate data and perform analysis routines. For further information on the LP980 spectrometer, or to enquire, please contact a member of our sales team at sales@edinst.com. The L900 software package controls both the LP980-K, kinetic mode operation, as well as the LP980-KS, kinetic and spectral mode operation. This ensures full compatibility between the two modes as well as a user friendly software environment for systems able to operate in either mode. The user can view pixel bitmaps of the CCD image to assess the quality of the image at the ICCD photocathode. This is particularly useful for setup and optimisation purposes prior to measurement sequences. 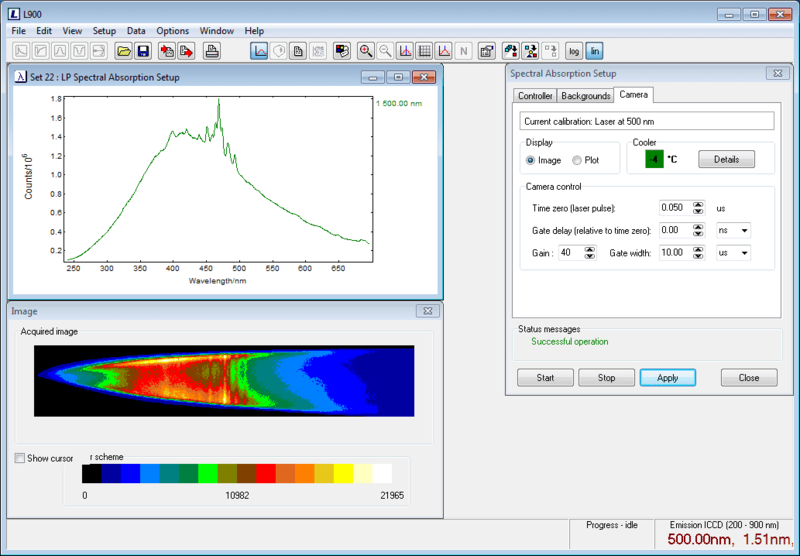 For standard measurements 2D images of the raw data and the resulting optical densities are the preferred plot options. Comprehensive spectral calibration features are available, and automatic software subtraction of camera dark noise is provided. A variety of different spectral measurement and correction options can be made. For example, with the probe shutter permanently closed normal time resolved emission spectra are taken. If a measurement sequence is made with a fixed gain and fixed gate width, but with incremental increase of the gate delay, a map of time resolved spectra is automatically generated. These can be sliced to produce kinetic decays at a given wavelength. Upgrade to our FLASH software package for advanced transient absorption curve fitting. The generation of spectra in kinetic mode by successive measurement at different wavelengths requires many excitation flashes. This can be problematic due to photo-degradation and stability of the sample over time. This can be overcome by upgrading to spectral mode and fitting an ICCD onto the instrument. The ICCD detector has a high dynamic range and an ultra-low readout noise and can be controlled by the L900 software. Cross-Beam Geometry: Standard sample holder of the LP980. Laser beam and probe beam intersect perpendicular at the sample position. The sample holder is designed to accept standard fluorescence cuvettes. Cuvettes can be positioned so that the probe beam passes through the centre of the cuvette or close to the surface of the incoming laser beam. The sample can be cooled by an external water circulator. Diffuse Reflectance: A sample holder for solid, non-transparent samples to be measured in Laser Flash Photolysis. This option requires samples to show significant diffuse scattering. Quasi Co-Linear Optics: A sample holder for low density liquid samples or gas samples to be measured in Laser Flash Photolysis. Laser beam and probe beam intersect in the sample in an angle of 3 degrees. Rapid kinetic accessory for manual multi-mixing of samples capabilities. Comprises sample handling unit fitted with three 1 mL drive syringes, 600 mm long umbilical, manually operated drive, square mixing/observation cuvette with standard dimensions (10 mm path way). The stop-flow accessory can be computer-controlled as an option. Note: This accessory can be used only with the halogen lamp as this is designed for ultimate long-term stability compared to arc-lamps. Liquid Nitrogen Cryostat (77 K – 300 K): Oxford Instruments liquid nitrogen cryostat, OptistatDN. The assembly comprises the cryostat head, the temperature controller, and a mounting flange and pedestal, directly compatible to the LP980 sample holder socket. Includes heater and sensor, cuvette holder, optical sample holder and sample rod. Spectrosil B quartz windows are used. Cryostat can be fully controlled by computer and L900 software. Liquid Helium Cryostat (3.4 K – 300 K): Oxford Instruments liquid helium cryostat, OptistatCF. The assembly comprises the cryostat head, the temperature controller, transfer tube and SV12 adaptor, VC31 gas flow controller, GF4 pump, and a mounting flange and pedestal that is directly compatible to the LP980 holder socket. Includes heater and sensor, cuvette holder, optical sample holder and sample rod. Spectrosil B quartz windows are used. Cryostat can be fully controlled by computer and L900 Software. Liquid Helium Cryostat Extended Temperature Range (3.4 K – 500 K): Oxford Instruments extended temperature range liquid helium cryostat, OptistatCF. The assembly comprises the cryostat head, the ITC503 temperature controller, the LLT600 transfer tube and SV12 adaptor, VC31 gas flow controller, GF4 pump, and a mounting flange and pedestal that is directly compatible to the LP980 holder socket. All other inclusions as the standard liquid helium cryostat. TE Cooled Sample Holder Standard Range (-10°C – +105°C): Thermoelectrically cooled 4-window cuvette holder with controller that enables stable temperature control of samples from -10°C to +105°C (-10°C with dry gas flow, 5°C without gas flow). The temperature can be held constant with ±0.02°C precision and can be rapidly changed. A magnetic stirrer (without stirrer bars) is included. 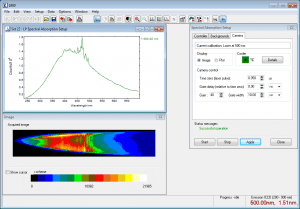 The TE cooled sample holder is fully controlled by the spectrometer operating software L900. TE Cooled Sample Holder Extended Range (-40°C – +150°C): Extended range thermoelectrically cooled 4-window cuvette holder with controller that enables stable temperature control of samples from -40 °C to +150 °C (-10 °C with dry gas flow, 5 °C without gas flow). The temperature can be held constant with ±0.02°C precision and can be rapidly changed. The temperature range can be extended below -10°C and above +150°C with a special cover in place and for temperatures below -10°C chilled coolant fluid will be required. A magnetic stirrer (without stirrer bars) is included. The TE cooled sample holder is fully controlled by the spectrometer operating software L900. Extended Red-Sensitive Photomultiplier (200 nm – 1010 nm): photomultiplier in standard LP920 housing. Detector response width of 7 ns, integrated with high voltage power supply. A range of InGaAs detectors are available that cover the range 900 nm – 2050 nm. For more details please contact us. The standard L900 software package can be upgraded to include the FLASH software package. This is used for advanced transient absorption curve fitting and includes features such as lifetime distribution analysis and exponential components analysis. Please click on the link to learn more about FLASH software or contact us directly. What is your expected excitation (pump) wavelength range? Will your samples be damaged/photo-bleached by high density incident light?